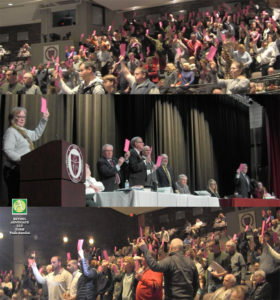 Photos above: A sea of bright pink voting cards were held high in the air and this photo shows those who did not want the turf field removed from the budget (in other words, in support of the turf field). The vote was 197 to 46 in favor of keeping the turf field in the budget, on a motion to remove the turf field from the Capital Budget. This includes officials on the stage, left to right as shown, Alice Hutchinson, First Selectman Matthew Knickerbocker, Comptroller Bob Kozlowski, Chairman of the Board of Finance Robert Manfreda, Selectman Richard Straiton, and Chairman of the Board of Education, Lawrence Craybas, voting in support of the turf field, to not remove the turf field from the Capital Budget. Other voters seen in audience, those standing and/or holding up a pink card voted same as above. All items voted upon in Monday night’s meeting for a $7.9 million budget were eventually approved by voters to go to Bethel’s 2018-2019 Budget Referendum, which will be held on Wednesday April 11, 2018 from 6:00 a.m. to 8:00 p.m.
At one point in the meeting almost 200 turf field supporters shouted extra loud, screaming “no” in unison, when asked by the meeting moderator, Alice Hutchinson, to vote on the turf field being removed from the budget, after a motion was made and discussion followed. 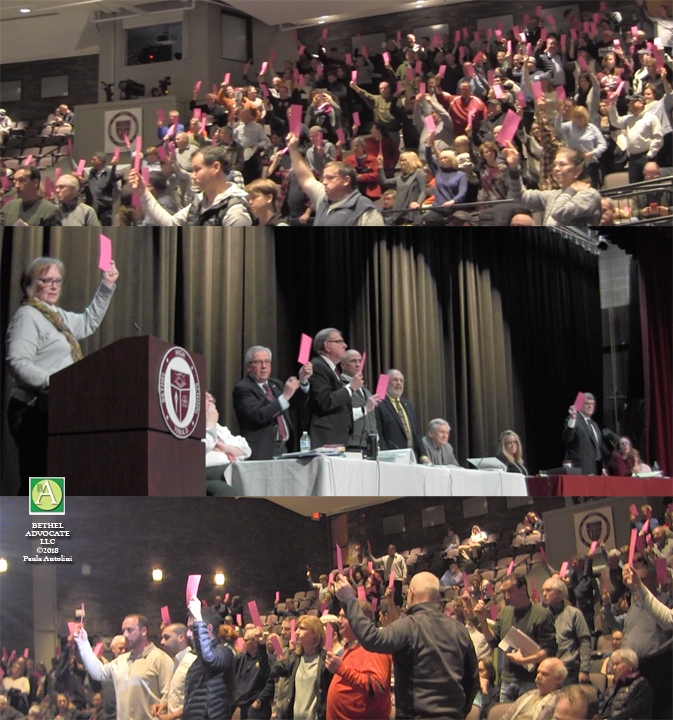 A sea of bright pink voting cards were held high above heads in the final vote on the motion to remove the turf field from the Capital Budget, which was 197 to 46 in favor of not removing the turf field. (Official count from Tim Beeble and Nancy J. Ryan of Bethel Registrar.) Applause followed from the turf field supporters, who all seemed to exit the meeting early, shortly after the official vote on that topic was taken in section 3 concerning turf field. The (Education) $979,000 high school turf field was a hotly contested topic along with it being mixed in with other items in same vote, but will now go to referendum bundled with the (Highway) Elgin Street Sweeper $230,000, (Highway) Class 8 42,000 GVW Truck $ 196,000, (Education) High School HVAC $ 250,000, and (Bethel Fire) Replace BFD Engine 6 $660,000. Other issues were brought up by residents. Bill Hillman made a motion to reduce line 420 by $400,000. “Minus $400,000 would have reduced the year-to-year increase in the budget to inflation levels and reduced the mill rate from 32.88 to 32.84. Instead of an increase to 33.04,” Hillman said, upon clarification after the meeting. Robert Palmer, a Bethel resident and member of the Bethel Board of Finance, immediately disputed Hillman’s figures in the original motion, and as Palmer spoke, Hillman objected in a Point of Order. :01 Lisa Bergh reading Notice of Annual Budget, 3:11 Alice Hutchinson moderator, 3:22 Phil Gallagher, 4:08 Alice Hutchinson moderator, 5:33 Martin Lawlor reading Notice of Annual Budget, 6:03 Bill Hillman motion, second Bob Legnard, 6:14 Bill Hillman, 9:20 Robert Palmer, 10:00 Bill Hillman, 10:13 Robert Palmer, 10:47 Billy Michael and Bob Kozlowski, 15:10 Frank Mineo, 15:36 Phil Gallagher, Bob Kozlowski and Robert Manfreda. :05 Cynthia McCorkindale, 3:26 Denise Foster, 5:33 Bryan Terzian. Bryan Terzian, Bethel resident and Board of Finance member, said, “I understand why the Board voted the way they did. I was in opposition to Capital non-reoccuring for a few reasons. One, we’re leaving out the equation of reevaluation. So to say it’s 16 cents on the mill is not telling the full story. 0:01 Greg Corrreard, 1:13 Cynthia McCorkindale, 1:58 Bob Kozlowski, 3:42 Bob Legnard, 4:16 Alice Hutchinson (moderator), 4:50 Phil Gallagher, 7:10Billy Michael, 8:17 Bill Hillman, 10:37 Alice Hutchinson (moderator). Greg Correard asked about the 420 account, “Is it not true that the million dollars was put into this account and all three selectman voted unanimously to have that maintained? First Selectman Matthew Knickerbocker answered yes. It did not go back to the Board of Selectman for review, it went to the Board of Finance who then reduced it to $750,000, Knickerbocker agreed. Come back to view more videos shortly! 1) To consider and take action upon a resolution to appropriate the sum of Twenty Nine Million Eight Hundred Sixty One Thousand Two Hundred Forty Two ($29,861,242) Dollars, which sum includes debt service of Three Million Nine Hundred Thirty Nine Thousand Two Hundred Thirty Eight ($3,939,238) Dollars and the school’s building maintenance account of Five Hundred Thousand and Eight ($500,008) Dollars as recommended by the Board of Finance, as the Annual Town Operating Budget for the Fiscal Year commencing July 1, 2018. 2) To consider and take action upon a resolution to appropriate the sum of Forty Five Million One Hundred Sixteen Thousand Two Hundred Eight Two ($45,116,282) Dollars as recommended by the Board of Finance, as the Annual Board of Education Budget for the Fiscal Year commencing July 1, 2018. 4) To authorize the First Selectman and the Treasurer of the Town of Bethel to borrow on short term notes or loans “tax anticipation notes” an amount not to exceed the aggregate of Six Million ($6,000,000) Dollars for the purpose of paying current expenditures of the Town of Bethel for the fiscal year commencing July 1, 2018, which tax anticipation notes are to be repaid from anticipated tax revenues. 5) To consider and take action upon a resolution that the tax on motor vehicles and personal property be collected in one or more than one installment. 6) To establish the date on which the machine vote on the annual town budget shall take place in accordance with the provisions of the Bethel Town Charter. 7) To do any and all things which may be legally required or appropriate to accomplish the above named purposes. Dated at Bethel, Connecticut this 23th day of March 2018.